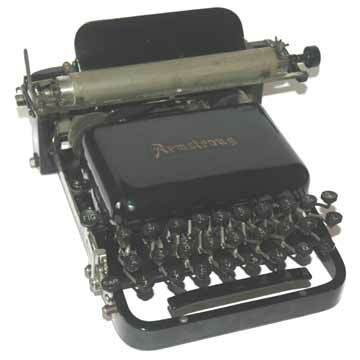 The blind writing upstrike American typewriter was produced by the same company that had built the successful mushroom-shaped index machine of the same name. The keyboard machine was a very simple design. The entire key lever, from keytop to type, was a single piece. The machine was apparently built until 1915, with model numbers going up to 9. The Armstrong, shown here, was sold in England. It was also known as the Pullman.